Back by special request. Originally posted at the Hullabaloo on July 15, 2006. The zip file contains a .Sims2Pack file. Unzip the file and save it on your computer in a spot where you can find it again. Then find the file and double-click it to install the house in your game. 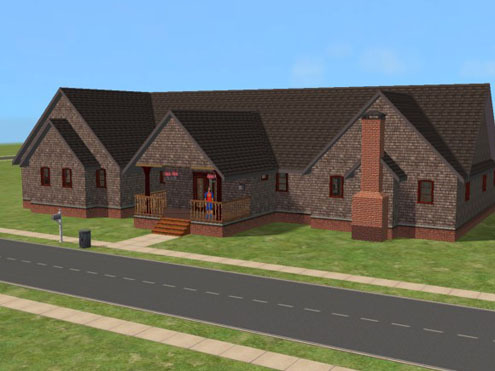 I have only the base game and University installed, so I think this house will be compatible with all versions of the game. This house is unfurnished. 4x3 lot, I think. No landscaping or lights, either. It contains at least one custom wall and a custom window. It might also contain Inge Jones's Simlogical bathroom door and Tunaisafish's smart door. This is the lot segment only. That means if you have the same stuff in your game that I did when I built this house, the furnishings will show up. If not, then not. 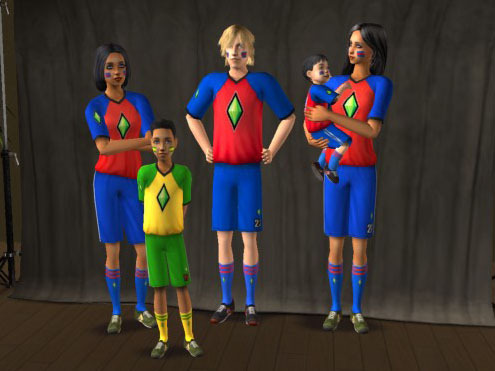 I wanted to test the Soccer Set before I fiddled with it, so I downloaded and installed it, and then created a family to wear the new duds. Thus was born the Geaulee family. (That's pronounced "go-LEE." Get it?) Quite predictably I become more interested in the family than in what they were wearing. I figured a bunch of soccer fans would fit in with the aliens, elves, and other oddities in Bonnyview Shores, so I moved them in. This picture is just for your amusement; not a download. Brandon Geaulee created by Maxoidmonkey. You get him with the Ultimate Soccer Kit download from EA. (See above.) His wife Anaserre is a clone of the hula zombie. Their three children--teen Zoe, child Yonkers, and toddler Xavier--were created as their genetic offspring in the Create-A-Family tool in the game. Then they needed a house to live in. I started building a house for a family of five, thinking I'd just whip out a quick-and-dirty little box for them to live in. I kept getting ideas and the house grew some interesting features in the building, to the point that I realized I'd built something rather interesting and unique, so here it is! Go to the original download topic to take a tour of the Gaulee House. I think I 'splained that somewhere in the tour on the Hullabaloo. Wow. U luv that siding. I do use that same basic decor quite a bit--the rustic siding with the rustic wooden railings.